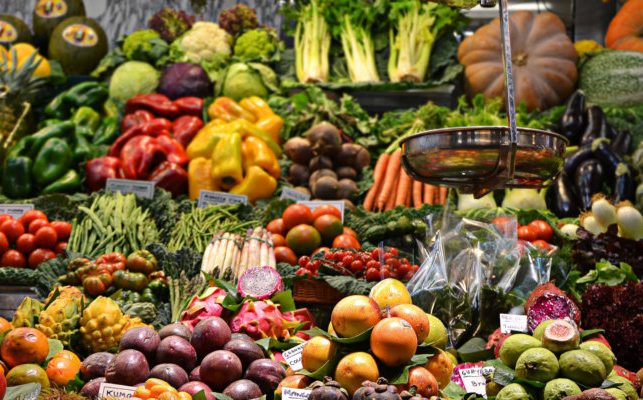 Spanish market: Vegetable-rich diets make for a healthier planet. The study simultaneously addresses what should be on the global supper table, and how it gets there. It presumes a daily intake for a 70 kg (165 pound) active adult male aged 30, or a 60 kg (132 pound) woman, of up to 2,500 calories per day, with around 35 percent of these from whole grains and tubers. It recommends a limit of 14 grams (0.5 ounce) of red meat per day, and 500 grams (18 ounces) of vegetables and fruits. The global appetite for red meat and sugar must be halved, while consumption of nuts, vegetables, legumes and fruit intake must double. And across the globe, people depend too much on starchy foods such as potato and cassava: in sub-Saharan Africa, 7.5 times too much. If people adopt a healthy diet and limit the use of processed foods, this would avert between 10.9 million and 11.6 million premature deaths each year.